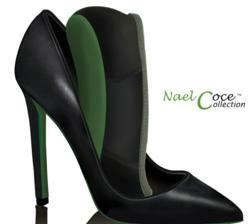 Baltimore native Sheena Young is launching “Nael Coce Ambi Collection”, a new line of eco-friendly high heel shoes that have a built-in flat shoe that are comfortable and have anti-bacterial features. Young, a chemist working on her Ph.D., is unveiling the new footwear, with their distinctive green soles, at a launch party, 8 p.m. – 1 a.m. Saturday at the Milan Restaurant and Lounge, 1000 Eastern Avenue, Baltimore, Md. The $35 event will feature shoe giveaways, shoe sales, a fashion show and a performance by Mario, the Grammy-nominated singer who also is a Baltimore native. A portion of the proceeds from shoe sales will go to the Women’s Funding Network, a global initiative that helps fund women’s businesses. To purchase tickets, go online to http://www.naelcoce.com/launchparty.html. The patent-pending footwear, currently available in black or gold glitter, is two shoes in one, available in sizes 5 to 11. They are a stylish 4-inch-heel made from earth friendly materials and a comfortable flat shoe that easily slips in and out of the high heel shoe. The insoles are made from natural organic fiber that is lightweight, hypoallergenic and non-toxic. The shoebox is made of recyclable paper that can be carried as a bag. Future styles will be unveiled at the fashion show, including a bridal line. Nael Coce, a division of ECOclean Corporation, a corporation that provides eco-friendly consumer products, is planning to launch a series of products in the months ahead. To interview Sheena Young or learn more about the shoes, contact Neil Foote, Foote Communications, LLC, 214.448.3765, neil(at)neilfoote(dot)com.